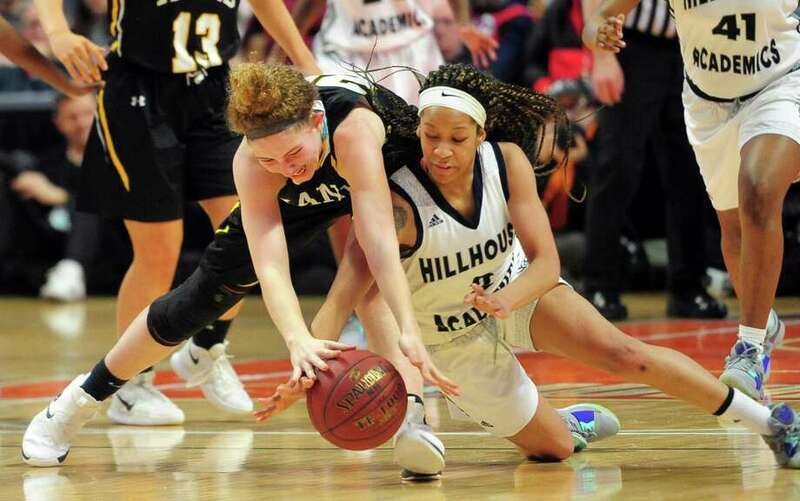 Daniel Hand’s Summer Adamds (20), left, and Hillhouse’s Ciara Little (2) reach for a loose ball during Class L girls basketball championship action in Uncasville, Conn., on Saturday Mar. 16, 2019. UNCASVILLE — It has been eight years since the last state championship trophy was raised for the girls basketball team at Hillhouse High. That wait is over. Behind 17 points and 12 rebounds from Tanayja London, 11 key points from Tyree Allen Chappell and an undeniable effort to win in honor of a beloved member of the Hillhouse family, the fourth-seeded Academics topped No.19 Daniel Hand 39-34 in the Class L finals at the Mohegan Sun Arena on Saturday for the program’s 10th state title. Playing this state tournament in the honor of the late Melvin Wells, who was tragically killed in a car accident two weeks ago, Hillhouse was not going to be denied a title dedicated to a man who meant so much to them. The Academics, who have started each state contest quickly, jumped out to a 14-0 lead in the game, before watching Hand even the game at 29 with 6 minutes, 12 seconds to go in regulation. Allen Chappell then followed seconds later with a key 3-pointer, and the Academics never trailed again. “We had that mindset of ‘All for Wells’”, Allen Chappell said. “It means a lot to us. Coach Wells was one of our main supporters. It hurt us when we heard. That was our main goal, to win it for him. The start of the game could not have gone any worse for Hand as the Tigers could not get going on offense, hitting on just a combined 2-of-10 from inside and behind the arc. Hand hit on just 14.3 percent from field goal range in the opening quarter. While the Tigers (14-13) cut the deficit to 21-12 at the half, it was the third quarter where Hand made its move. A 3-pointer by Summer Adams got the Tigers within 23-19 with 5:51 left in the third, and a bucket by Julia Kuhn had the Tigers within a basket at 29-27 with 55 seconds left in the third. Hillhouse, which swept all three meetings against Hand this season, never wavered. After Adams evened the game at 29 just 1:37 into the fourth, Hillhouse held Hand to just five points the rest of the way. Not only did the defense step up, so did Allen and London as Allen banged in a big 3-pointer 20 seconds later and London connected with 4:16 to go for a 34-31 Hillhouse lead. The Academics (24-4) were not to be denied their first state title since 2011 as they set the tone right from the start, scoring the first 14 points of the game. Even an ankle injury to Allen Chappell, which forced her to miss almost six minutes in the opening quarter, could not slow down Hillhouse. Ranasha Frazier scored four points in the early run, finished with six in the quarter, and helped the Academics to an 11-0 lead. Hand did not get on the board until 3:12 remained in the quarter on a free throw by Sara Wohlgemuth, and did not connect on its first shot other than a free throw until Wohlgemuth nailed a 3-pointer with 2:20 to go in the first quarter. The Tigers made a game of it with an 8-0 run to get within 16-11 as Wohlgemuth drained a 3-pointer at the end of the opening quarter, and Kuhn and Anna Beccia hit field goals to open the second quarter. Hillhouse, on baskets by London, closed the quarter on a 5-2 run and took a 21-12 lead to the half. Wohlgemuth and Kuhn each led Hand with 12 points. Tyree Allen Chappell — Hillhouse senior scored 11 points, including a key 3-pointer which put Hillhouse on top for good, and added six rebounds. — Hillhouse coach Catrina Hawley-Stewart on dedicating the title to Melvin Wells.